Get all the technical specifications for the Millennium Falcon! Get all of the technical specs to the fastest hunk of junk in the galaxy! 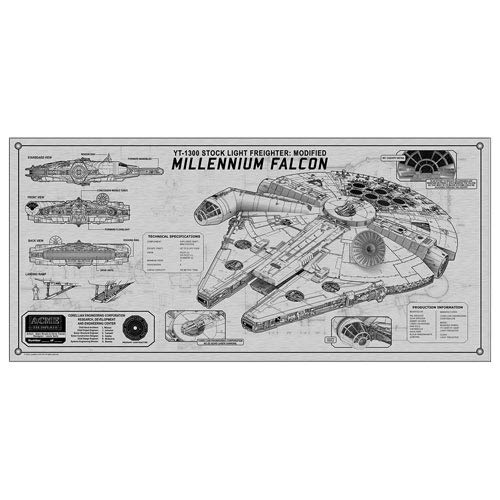 The Star Wars Millennium Falcon TechPlate from Acme Archives is nothing short of astonishing. Printed on a 1/8-inch thick aluminum metal plate, this amazing TechPlate measures 21 1/2-inches wide x 10-inches tall. Han Solo's pride and joy is displayed in all its splendor, with tons of detailed information about the ship, and alternative images for reference. If you're a fan of the Star Wars series, this beautiful collectible belongs inside your home! Limited edition of just 295 pieces, with certificate of authenticity. Designed by a group of Naval architects from Seattle, this TechPlate is modeled after the commemorative christening plates affixed to the bulkheads of ships. Ages 18 and up.